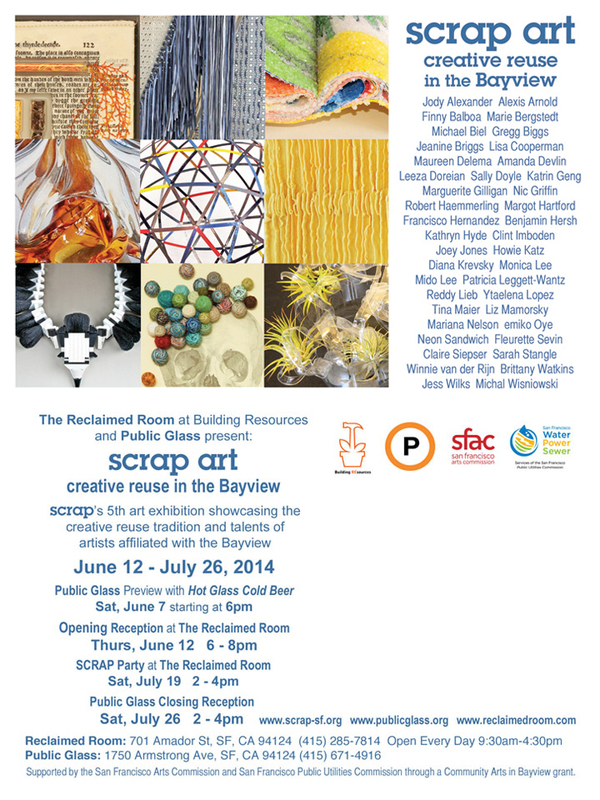 SCRAP ART: Creative Reuse In The Bayview opens June 12th!! Please mark your calendars for our new show! We are pleased to partner with SCRAP, our lovely neighbors, for a juried exhibition of local artists engaged in creative reuse. The show features works by dozens of artists and is housed at our venue as well as at Public Glass, another one of our lovely neighbors. A celebration of the Bayview district as well as community partnership, this exhibit will not disappoint. Includes work of all sizes, shapes and mediums from innovative jewelry, to striking sculptures, to unclassifiable fascinating creations that will certainly blow your mind and get your creative imagination going. Food and Drink and meet the artists! Prizes will be awarded to 1st 2nd and 3rd place artists who competed in this call at that time!! This project is supported by the San Francisco Arts Commission and San Francisco Public Utilities Commission through a community arts in Bayview grant. Sewer Ride and Gallery Party tomorrow! Don’t miss out on this eclectic meet and mingle affair. Join Building REsources customers, SFBC Sewer Riders, Beneath the Surface artists, and gallery patrons for beer and pizza tomorrow at 701 Amador Street! Get a little shopping done, check out the awesome display, hear tales from the the Sewer Ride and more from 3-5pm. Beer and pizza provided by Building REsources and the RE Room art gallery. 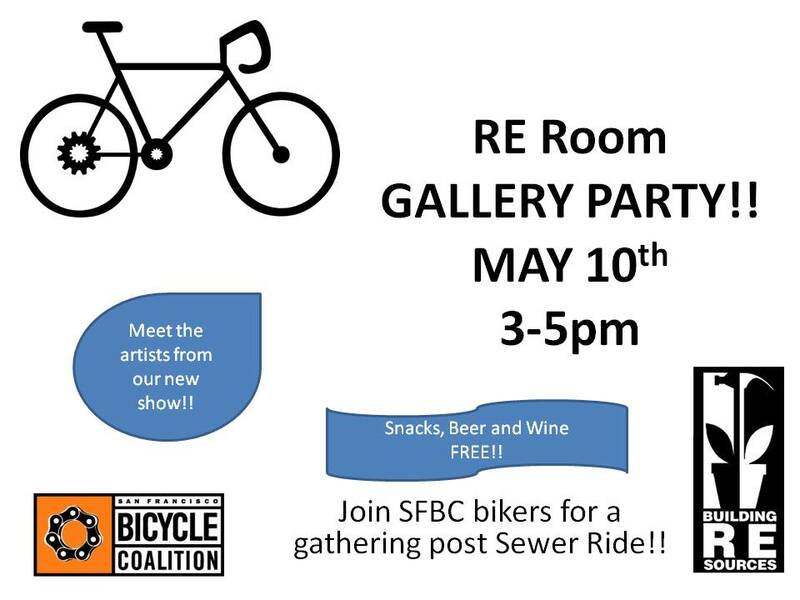 Please join us this Saturday for a special gallery party in honor of the resurrected Sewer Ride sponsored by the San Francisco Bicycle Coalition. The party goes from 3-5pm at the Reclaimed Room gallery inside Building REsources. There will be bicycle parking for riders and feel free to shop while you are there, Building REsources stays open for business until 4:30. In attendance will be the artists of our current exhibition, Beneath The Surface. 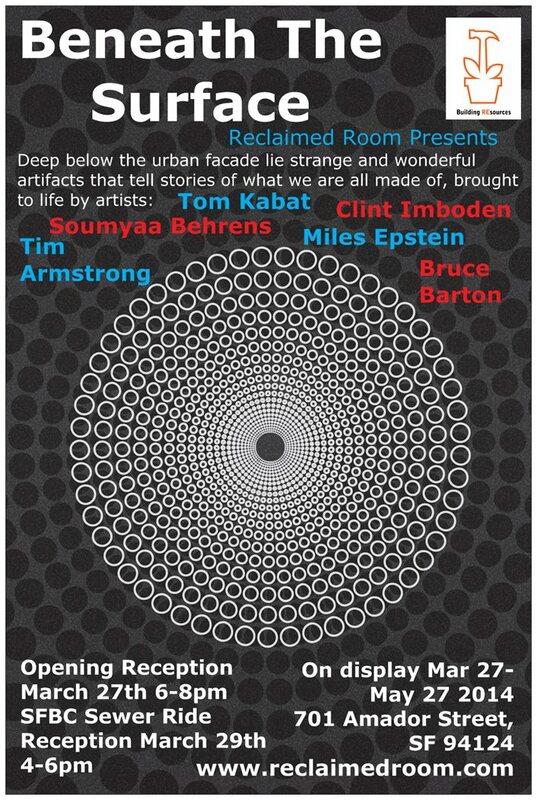 Meet and mingle with Clint Imboden, Miles Epstein, Timothy Armstrong, Soumyaa Behrens, Tom Kabat and Bruce Barton. Beer, sodas and light snacks will be provided, as always, FREE of charge. We truly hope to see you there. And, mark your calendars for our next show! June 12th kicks off a unique partnership with our friends down the street, SCRAP! SCRAP ART: Creative Reuse In the Bayview is a juried show that spans Reclaimed Room, Public Glass and the Salvation Army on 3rd Street. This ambitious show will feature dozens of local artists, and prizes for 1st, 2nd, and 3rd place will be awarded! For information on the Sewer Ride that starts off at the DALY CITY BART on May 10th at noon, see the link below. The ride ends at the gallery. Sign on for both or just come for the party Either way, we hope to see you this Saturday. The weather looks inviting so no way we are canceling this one! One of the great products made and available at Building REsources is RED SHOVEL GLASS. 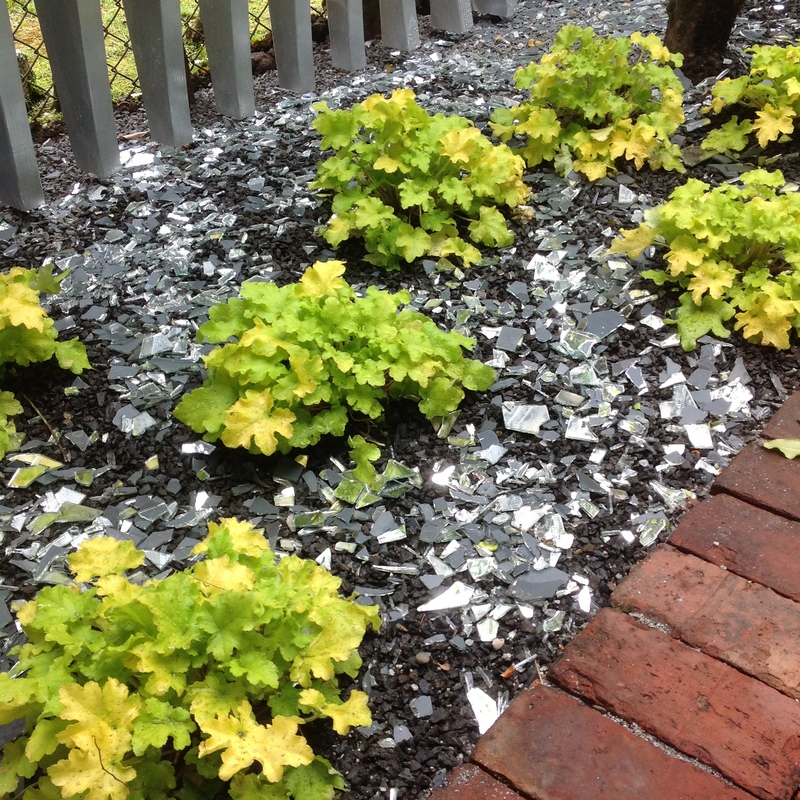 Red shovel glass polishes and smoothes recycled glass, mirror and wine bottles to create amazing, beautify landscape material. Similar to the effect of the ocean waves over decades on glass debris, only much much faster with the use of specially crafted cement shakers that take the raw materials and wear them down in record time. Now on display as part of the San Francisco Decorator Showcase, Red Shovel glass can be seen in use and in full effect. 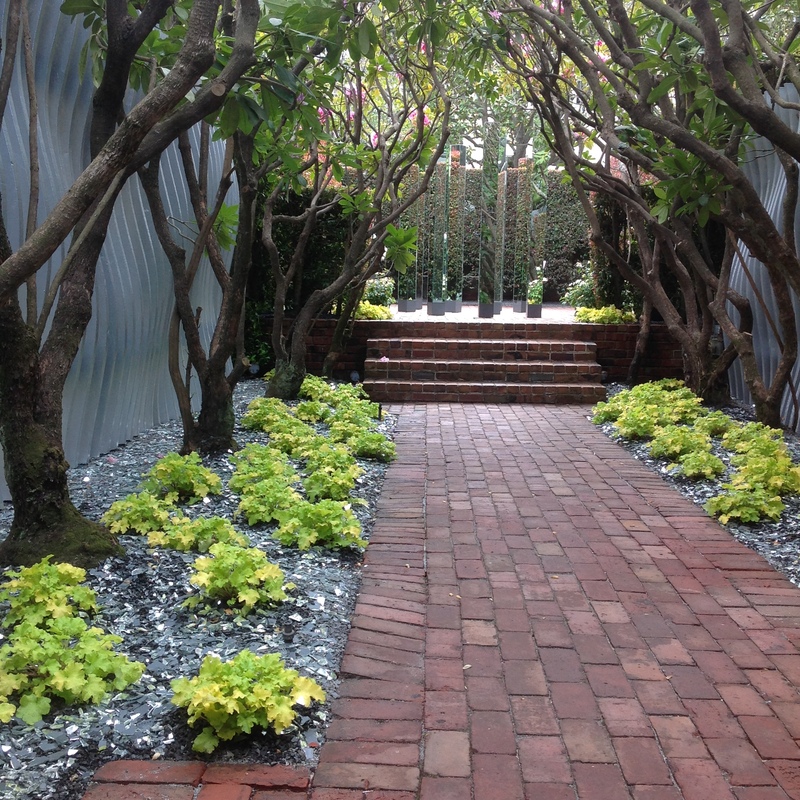 The San Francisco Home Decorator Showcase goes on until May 26th. It is located at 3660 Jackson Street and open to the public for viewing. Go check it out while you can and consider what YOU could do with this wonderful material in your own front or backyard.